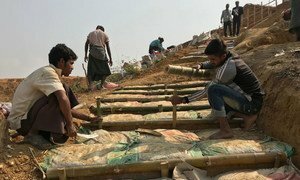 UNICEF supplies vaccines for a massive cholera vaccination campaign targeting all Rohingya refugees that have arrived in Bangladesh. Critical health services must be scaled up for nearly 1.3 million people – Rohingyas and their surrounding host communities – in Bangladesh’s Cox’s Bazar, where vulnerable populations in crowded settlements and ‘mega camps’ are at risk of a host of waterborne diseases, the United Nations World Health Organization (WHO) warned Tuesday. “Commendable efforts have been made by the Government of Bangladesh and partner agencies to provide health services; prevent diseases such as cholera; and rapidly control outbreaks of measles and diphtheria. However, the challenges are huge, multiple and evolving,” said Dr. Poonam Khetrapal Singh, Regional Director for (WHO) South-East Asia. “The magnitude of the crisis requires continued efforts and generous contributions by all partners to scale up health services for the vulnerable population,” she added. One of the largest population movements in the shortest time span began 25 August when an estimated 688,000 Rohingyas crossed from Myanmar to Cox’s Bazar – joining nearly 212,500 others who had arrived in earlier waves. Health needs continue to be immense, particularly surrounding reproductive care. Some 60,000 children are expected to be born in the camps over the next year. Besides mothers, newborns and children, the elderly need basic health services, including for trauma and various non-communicable diseases, such as heart disease, diabetes and psychosocial support. “Water and sanitation, and shelter continues to be far from optimum, increasing the risk of rapid spread of several communicable and water borne diseases,” the Regional Director said, stressing the need to accelerate efforts to address the key determinants of health on a priority. The upcoming rainy season increases the vulnerability to waterborne diseases, such as diarrhea and hepatitis, and vector borne diseases, including malaria, dengue and chikungunya. When the crisis first began, WHO established the Early Warning and Response System (EWARS) for rapid detection and response to disease outbreaks to minimize death and disease, which along with risk assessments, prompted Bangladesh to carry out large scale vaccination campaigns for cholera, measles and rubella, polio and diphtheria. “The health sector is grossly under-funded and grappling to meet the needs of the affected population,” Dr. Khetrapal Singh said, appealing to international community to contribute generously and commit to support what clearly is set to be a protracted emergency. At the same time, Andrej Mahecic, spokesperson of the Office of the UN High Commissioner for Refugees (UNHCR) warned on “the situation of several thousand Rohingya who have been living in a so-called ‘no man’s land’ near the border between Myanmar and Bangladesh” since end-August. “We estimate there are some 1,300 families, approximately 5,300 men, women, boys and girls living in the area near Tombru canal,” he stated, noting that some feared returning home and wished to seek safety in Bangladesh. He reiterated that everyone has the right to seek asylum, just as they also have the right to return home when they deem the time and circumstances right. “People who have fled violence in their country must be guaranteed safety and protection, and must be consulted on their future,” he underscored. Meanwhile, ahead of the monsoon season, UNHCR and partners continue to step up preparations to protect refugees, including encouraging those most at risk of floods and landslides to relocate to other areas. “UNHCR staff are facilitating community engagement in preparedness efforts, in particular on appropriate messaging to communities likely to be affected by landslides, floods or cyclones, and analyzing community coping mechanisms and preparedness plans,” he concluded.